"The first thing that I noticed about why this band is still around is the songs. It is definitely because of the songs. As far as what they do to keep going...I don't know, they drink a lot." Very few musical acts can stake a claim to the amount of influential clout that UFO can. 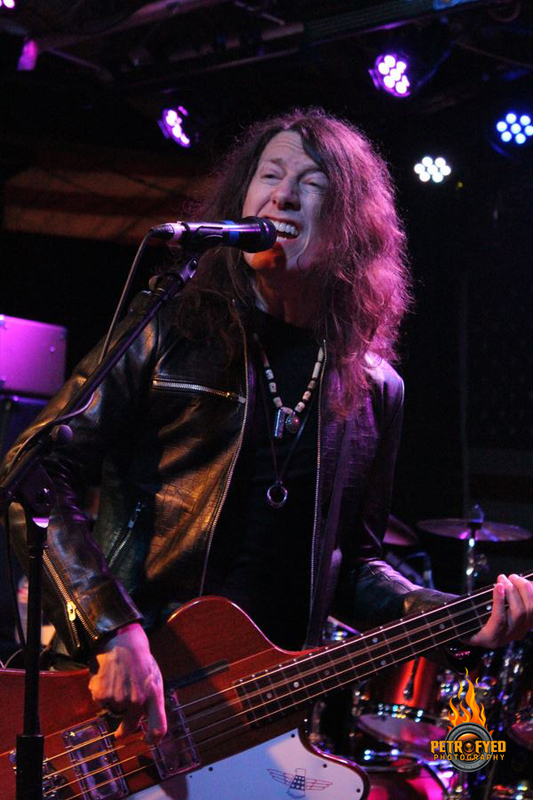 When preparing for this interview with bassist Rob De Luca I came across a quote that really put it best; “UFO is the favorite rock band of your favorite rock bands”. It is true. Over their storied career, UFO have influence a seemingly insurmountable number of musicians spanning across several rock and metal genres. Ask anyone who has been to an IRON MAIDEN show and they will tell you that the band takes the stage right after “Doctor Doctor” every single night. METALLICA's Kirk Hammett has cited UFO time and time again. Frank Hannon of TESLA suggests that Strangers In The Night is the single best live album ever recorded. What is even more impressive is the band’s prolific ability to continue writing, recording and touring. 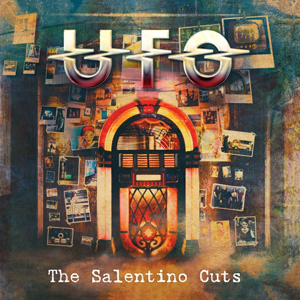 Just in the last week, UFO released The Salentino Cuts and before the band’s performance in Akron, Ohio I had the chance to sit down with bassist Rob De Luca to talk about the new album as well as being a part of such a legendary act. KNAC.COM: Just in the last week, UFO released a new album of all covers. What is the significance behind the name The Salentino Cuts? DE LUCA: Well, that was Phil (Mogg's) choice and we recorded in Hanover, Germany and after recording or after rehearsal, we would go back to this restaurant and kind of eat, drink and talk about what we were working on and progress, etc, and that place is called Salentino's. So that became our de-facto clubhouse, thus the name. KNAC.COM: What kind of process or reasoning was used to determine which songs were covered on the new album? DE LUCA: Lots of drunken nights writing lists on the tour bus followed by mornings of ripping up the lists and starting over. It really was a lot of that, but we finally got about fourteen or so songs on a list that we went in and cut and chose the eleven or twelve that are there. But in the end it is always how it suits Phil's voice or the singer's voice, you know. It has got to work. Sometimes you just have a good idea that when you play it as a band, this isn't quite what we envisioned. And sometimes we are surprised and something turns out better than expected, which happened a lot, I think. KNAC.COM: Yeah, from the sound of the album, I would say so. DE LUCA: It was really a fun record, you know, we were not just 'phoning it in'. We really gave a lot of attitude to each song. KNAC.COM: Did all of the members in the band have an input on the material? DE LUCA: I think so...I think most of them were probably chosen by Phil. I know Vinnie (Moore) chose the Robin Trower song, the MOUNTAIN, the MONTROSE song, among others. I chose the John Cougar song. Andy (Parker) chose...I know he chose a Tom Petty song, among others. KNAC.COM: And how significant is that now, right? DE LUCA: Yeah, quite a coincidence, right? ...a bad coincidence. KNAC.COM: Are any of them getting worked into the live set, either tonight, or perhaps on this tour? DE LUCA: Not yet, but I would expect that they will be. 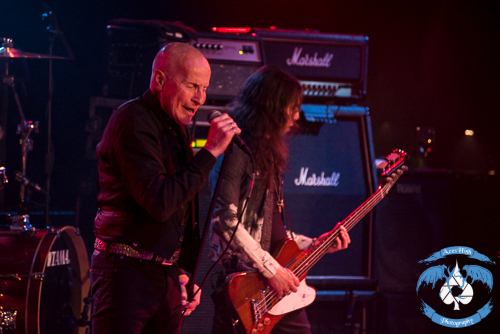 KNAC.COM: What is your favorite UFO song to perform live? DE LUCA: "Love To Love" - definitely, by far. It is just so - it's everything, that song. It's mellow, it's heavy, it's proggy, rock...it's big rock. It's so dynamic, you know, for me, it's just everything that a song should be. It's interesting, it's simple, it's complex at different times. It's just perfect and the audience reacts so strongly to it, they must feel the same. KNAC.COM: Now...I believe Vinnie Moore is the longest tenured guitarist in the band now. DE LUCA: I would say by double or triple maybe. KNAC.COM: He has really helped to stabilize the band, but you still have some of the UFO purists that like to sort of separate the catalogue into the "Chapman" era and the "Schenker" era. Which of these two eras, considering the material, do you prefer? 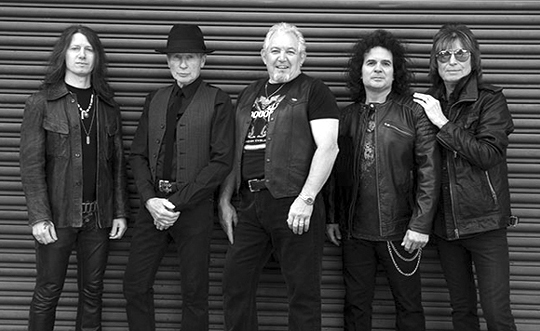 DE LUCA: I saw them during the Chapman era as a kid, but I would choose the Schenker era, purely based on the material. I think they wrote more great ballads in the Chapman era, but if I had to choose, I would choose Schenker. KNAC.COM: I believe you guys have started incorporating "We Belong To The Night" into the set to sort of represent the Chapman era of the band. DE LUCA: We've tried. We did "Long Gone" in the spring and we did it previously, maybe 3-4 years ago maybe. It's a very good song, but it just doesn't seem to translate live. In other words, we try to bring in Chapman stuff and sometimes it's just difficult. KNAC.COM: You've been in the band, what, almost ten years now, right? DE LUCA: It is going to be ten years in April. KNAC.COM: I know you have written and recorded with them before, but I just have to ask you, what was it like to be in the studio and taking part in the writing process with these legendary artists? DE LUCA: It is amazing. I don't over-analyze it too much because, being in bands in your life and coming up through the process, you know, the template is pretty much the same. You get in a room...you get ideas however, CDs, cassettes, over the internet...and you hear people's ideas. You come up with ideas that could work, but you realize that is all going to change once you get in a room. You put together a general idea for a song; you get in a room and work things out and play off of each other, you hear things that you didn't notice as much and it causes you to go somewhere else. So I would say the process I have been doing my whole life, but to do it with UFO is really a treat because I saw them as a kid and they really are a legendary band. So, to be involved on that level is very rewarding and incredible. KNAC.COM: We have talked about your tenure in the band...now, what did it take for you to feel like a full-on member and not just a hired gun or touring member? At what point did you realize that? DE LUCA: Well, I think, as it was going along, I got a little bit more comfortable every year. And they got a little bit more comfortable every year with this lineup. But then, when I started getting asked to play on records and be in band pictures, that obviously was a huge change. KNAC.COM: For those that may not be familiar, if you would, talk about the scenario that landed you the position. I heard that Ron Bumblefoot Thal was involved. DE LUCA: That is true. Basically Vinnie and Ron are good friends and I did a bunch of shows opening for GUNS N' ROSES on their Chinese Democracy tours. So, I guess Vinnie and Ron had some kind of conversation saying that they just need someone who is solid, who is a good guy and Ron recommended me and said; 'you don't need to audition, he is definitely what you are looking for' and went to bat for me, which was amazing. So I showed up at rehearsal and we were on tour the next day. And Ron seems to have been right or they would have canned me a long time ago. Ron is an incredible musician and he is instinctual like that. When Vinnie told him what they were looking for, he knew it was a fit. KNAC.COM: Was there a lot of pressure in the beginning? Was it stressful? DE LUCA: I am sure it was. I don't remember that fact about it. You know, it's a lot of material and you don't want to make any mistakes. You can't really think about performing yet, you just want to make sure you're ready for the next part coming up because they come by so quickly if you're not thinking and that's the way it is when you first get a gig. You are thinking more than just being. It takes a while for it to become natural. I would assume it was somewhat stressful, but any new gig is stressful. KNAC.COM: I don't know how many people may realize this, but didn't you grow up in the same town as Vinnie Moore? DE LUCA: Very close, although I never actually met Vinnie until I was in UFO, but I heard of him, because even in high school - we're the same age - even in high school he was famous among kids because he was just that good. He was just that much better than everyone, from that moment when he picked up the guitar for the first time. He's like "Billy The Kid", the legend was spreading..."Vinnie The Kid". KNAC.COM: I wanted to shift gears for a moment and talk about some things that just you are involved with. I wanted to know if you could tell me a little bit about your project OF EARTH and if there is anything in the works at this time. DE LUCA: Not at the moment because I have been so busy. OF EARTH is a band that I play bass and sing for - I have a much more prominent role in that band where I am the lead singer and I am the songwriter and producer. It's basically a chance to stretch out and not have to always be heavy. It is more surreal and psychedelic; I think it rocks at times, but it's also very mellow at times and it goes through all the degrees between those two. But in general it's more trippy, but it is important to me to be able to express that side because that's probably the music I hear in my head most. So we are in the process of doing our third record now, but it's a long process because I am so busy. Right after this, I go back out on tour. KNAC.COM: I also wanted to mention SPREAD EAGLE here, because I believe I saw that you guys played some dates this summer. What can we expect from SPREAD EAGLE? DE LUCA: SPREAD EAGLE is the band that I formed when I was a kid and we were signed to MCA/Universal Records. It's the band where I kind of learned how to be...in a band. That's where I learned what to do and what not to do; to be able to make mistakes and learn from it and do things correctly also. We released a couple of albums back in the 90's and there was a minute where it looked like we were going to break big, but never did. We got back together in 2006 on and off. I reissued the record and we did some touring and now this year we went to Germany and played for the first time and it was a real treat; it was a lot of fun. KNAC.COM: The reception was good? DE LUCA: It was amazing. It was amazing. Better than I expected, so now we are going to make a new record. We got some worldwide offers and we will be recording that in 2018. KNAC.COM: How cool is that? Is it a similar or original lineup? DE LUCA: The lead singer and I are original and we have my cousin, Rik De Luca on drums and Ziv Shalev on guitar. KNAC.COM: Now, you have been a part of a lot of bands spanning many genres over the years; UFO, Sebastian Bach, HELMET, Joan Jett - to name a few. What has been your favorite moment? DE LUCA: Recording and writing on A Conspiracy Of Stars record was definitely a highlight in my career and in my life. KNAC.COM: And you did get writing credits on that album. DE LUCA: Yeah, on three songs. Touring South America as direct support for GUNS N' ROSES in general was amazing with Sebastian Bach, but touring South America was definitely storybook in front of twenty to seventy thousand people a night. So that was definitely a highlight. Releasing the OF EARTH records, even though it is a small scale, really meant a lot to me because I was basically doing it myself. So there's some highlights right there. KNAC.COM: Last question, it has been almost fifty years since Phil Mogg and Andy Parker got together to form UFO, so in terms of longevity, but also staying relevant, what tips or tricks have you learned from the guys about being on the road, staying at the top of your game and staying healthy at this advanced state in their careers? DE LUCA: Well, the first thing that I noticed about why this band is still around is the songs. It is definitely because of the songs. There’s a lot of factors happening to be around for fifty years. There's not many bands that are fifty years old that are out there right now, definitely less than ten. I would say the biggest factor is the songs. They just won't go away and that emotion that they bring up in people is not a fleeting thing. It's there inside of those people and they come back every year to feel that and to share that. As far as what they do to keep going...I don't know, they drink a lot. KNAC.COM: Alcohol is a preservative, right? DE LUCA: (Laughter) So...I don't know man. They have a lot of fun. They are always laughing, they are always joking. Maybe that's it. Maybe not taking anything too seriously. Maybe it's those two factors; the songs and not taking things too seriously.